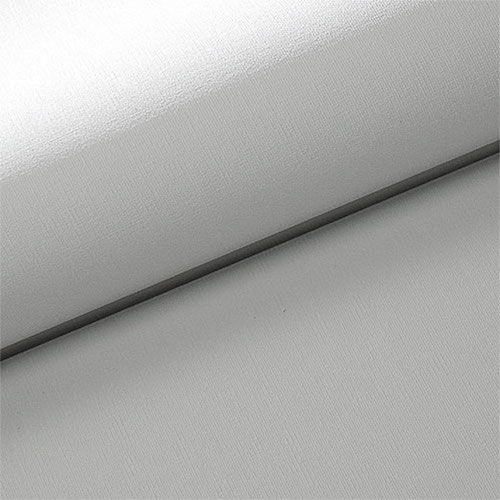 Controliss Casa Hushed White battery powered roller blind: Our beautifully subtle Casa Roller blind fabric offers great levels of privacy and protection from the sun while still allowing light to gently filter into the room. Flexible, modular power options with easy DIY installation and no electrical expertise required. Reloadable battery tube: A reloadable battery tube designed to hold 8 AA lithium batteries An average battery lifespan is around 12 months based on 2 up and down operations per day. Rechargeable battery tube: A reloadable battery tube designed to hold 10 AA NiMH rechargaeable batteries. Solar Power: An environmentally friendly Solar photovoltaic panel continuously trickle charges 10 AA NiMH batteries powering your blind. 12V Plug-in Power Supply: Supply maintenance free power with an AC/DC plug-in power supply unit. Our whisper quiet 240V AC mains electric motors offer the ultimate in luxurious and efficient blind motorisation. 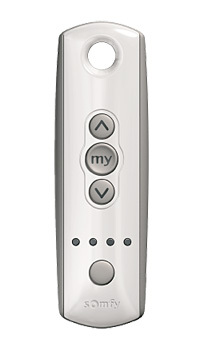 RTS Remote Control: Fully integrated RTS radio receivers for convenient remote control operation via Somfy RTS controls. 4-Core Switched: Ideal for integration into home automation systems with extrernal relays or motor controllers such as LightwaveRF, Control4, Crestron and KNX. 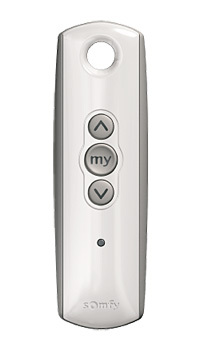 Somfy Telis 1 RTS Pure Handset is a single channel Radio Handset. 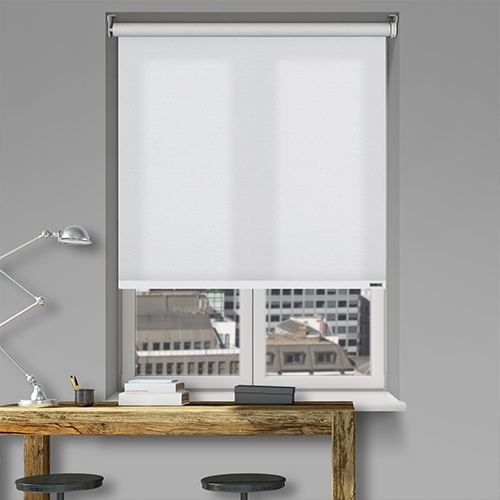 The single channel means it can control 1 blind, or a group of upto 8 blinds simultaneously, up to a range of 20 metres through 2 concrete walls, so line of sight is not required to operate your blinds. 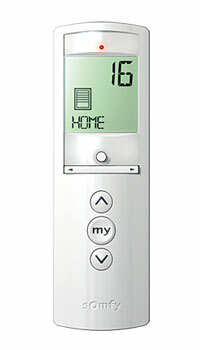 With fully integrated up, down and stop functionality, as well as a programmable “My” favourite setting, the handset is ideal for controlling one blind - or even multiple blinds simultaneously - at the touch of a button. The handset is supplied with the 3V Lithium battery, as well as a wall mounted hanging pin. The Telis 1 RTS Pure handset, is Pure white in colour. Each channel can control blinds individually or as a group, up to a range of 20 metres through 2 concrete walls so line of sight is not required to operate your blinds. With fully integrated up, down and stop functionality, as well as a programmable “My” favourite setting, the handset is ideal for controlling multiple blinds at the touch of a button. Telis 4 RTS Pure handset, is Pure white in colour. Somfy Smoove Wireless Wall Mount Control is an RTS switch to control 1 blind, or a group of blinds simultaneously, up to a range of 20 metres through 2 concrete walls, so no line of sight is required to command your blinds. 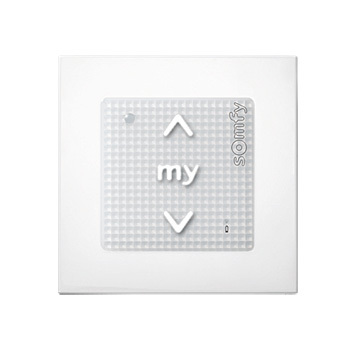 With fully integrated up, down and stop functionality, as well as a programmable “My” favourite setting, it is ideal as a wall switch for controlling numerous blinds simultaneously. Fits directly onto the wall or to a standard electrical box. Includes the central control module with the standard pure white frame and wall fixing plate. The handset is supplied with 2 AAA Alkaline batteries, as well as a wall cradle. Telis 16 RTS Pure handset, is Pure white in colour. 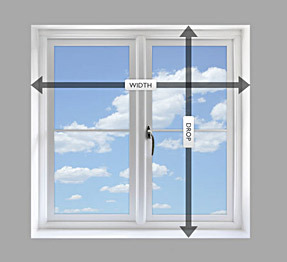 Measure the inside width of the window Recess. We would always recommend measuring the top, middle and bottom in case the recess is out of square and then using the narrowest measurement. Measure the inside drop of the Recess. We would always recommend measuring the far left hand side, the centre and the far right hand side and then using the shortest measurement. When Recess sizes are given Controliss Blinds will take all the nessasary adjustments to ensure you receive a perfect fitting blind. 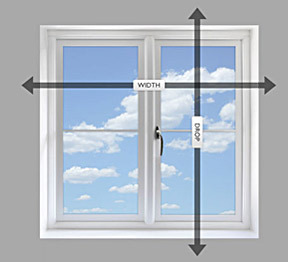 When measuring the width decide how much you would like the blind to overlap the window recess. We would recommend a minimum of 50mm each side although this is largely down to personal preference. Please take care to account for any obstacles that may interrupt the usage of the blind. When measuring the drop decide how much you would like the blind to overlap the window recess. We would recommend a minimum of 70mm above to allow for convenient fixing of the mounting brackets. The bottom overlap is very much personal preference. Ready to install Controliss battery powered remote control roller blind with integrated 12V DC RTS motor for one-touch remote control operation. Installation brackets suitable for either top fix or face fix. With your chosen power supply option, either: reloadable battery tube, rechargeable battery tube, solar power pack or UK plug-in mains adaptor Comprehensive installation instructions are provided with each blind along with detailed configuration options for programming your remote control.